Sample collection and handling influences the sensitivity of the different microbiological techniques employed. Whenever possible, samples should be collected before beginning chemotherapy, in open areas or in well-ventilated rooms. Despite the advances made in the past 30 years in the microbiological techniques used for diagnosing TB, only a small portion of the global world population can benefit from them. The main diagnostic method in low- or middle-income countries is smear microscopy with the Ziehl–Neelsen technique, due to its simplicity, rapidity, reproducibility, low cost, and effectiveness in detecting infectious patients. 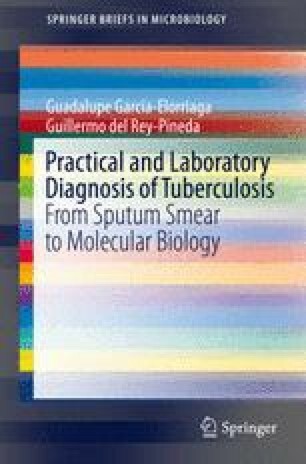 The other basic diagnostic technique of TB is culture, the only available method that can establish a definitive diagnosis and that can be used for close patient follow-up and to confirm final cure. Culture, moreover, is more sensitive than smear microscopy. Biochemical techniques, chromatography, and genetic probes can be used to identify different mycobacterial species. However, only biochemical testing is routinely used in low- or middle-income countries due to its lower cost; these methods, however, may be complicated to perform; they yield results slowly and lack reproducibility. In low- or middle-income countries, drug sensitivity should be determined following Canetti’s method of proportions in Löwenstein–Jensen medium. Reading should be obtained after 4–5 weeks, and the laboratory must inform the clinician on the sample’s level of growth in the medium with added antituberculous drugs and in comparison to the medium without medication.